ONE GIANT LEAP FOR MOUSEKIND. Friday morning, SpaceX launched a Falcon 9 rocket from Florida’s Cape Canaveral Air Force Station. It’s destination? The International Space Station (ISS). Though unmanned, the rocket is carrying some very important passengers: 20 laboratory mice. The mice are part of a study by Northwestern University’s Center for Sleep and Circadian Biology (CSCB). The plan: ten will spend a record 90 days in orbit, while the other 10 will return to Earth after 30 days. The researchers will see how space affects the mice’s circadian rhythms (biological processes that occur in 24-hour cycles), microbiome (the bacteria and other microorganisms that live in and on the body), and other physiological processes. TWINSIES. This new study builds upon the another also the CSCB researchers worked on: NASA’s Twins Study. For that project, astronaut Scott Kelly spent one year aboard the ISS while his identical twin brother Mark (also an astronaut) stayed on Earth, serving as something of a control. Earlier this year, NASA released the study’s preliminary findings, noting that Scott’s time in space had affected the expression of 7 percent of his genes. The 20 mice heading toward the ISS also have identical siblings that will remain on Earth at a NASA research facility. There, they’ll experience the exact same conditions as their high-flying siblings — the same lighting, the same temperatures, the works — just on a three-day delay. While mice and humans are biological different (obviously), the hope is this near-exact replication of conditions will provide an even more accurate account of space’s impact on the body than the Twins Study. After all, while Scott was aboard the ISS, his brother was living his own life on Earth, and the things he did could have had some impact on the study’s results. THE PATH TO MARS. We already know of a myriad of health risks linked to space exposure — vision loss, cancer, psychological ailments — but we don’t really know how a long time in space might affect the human body. Given that a mission to Mars will likely take several years, we need to figure that out before we send anyone to our planetary neighbor. 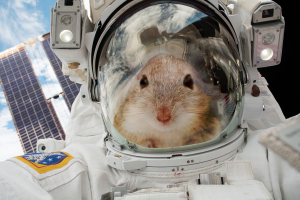 While 90 days might not seem long, it’s equivalent to nine years of our lives, so these little astronaut mice might hold the key to figuring out what happens when we spend a significant period of our lives beyond Earth’s atmosphere.